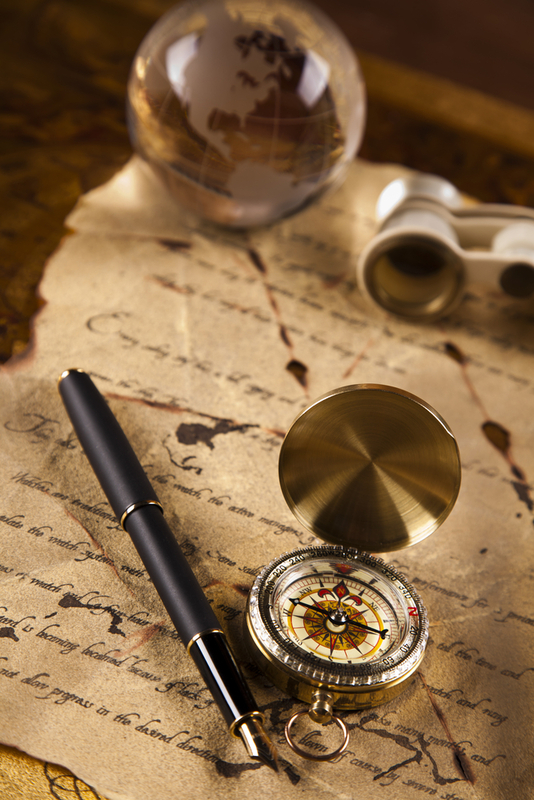 In 1492, Columbus sailed the ocean blue… with a whole lot of maps and information about the very round Earth. Contrary to popular belief, not only did Columbus realize the world was round, so did his contemporaries. In fact, it was so well accepted that daring seafarers had been exploring the Atlantic for hundreds of years before Columbus’ time. Without a doubt, men of the early Renaissance knew the world was round, and that the Nina, the Pinta and the Santa Maria were in no danger of sailing over the edge. Later, the Roman Ptolemy added to the collected wisdom. He observed that as a man approached a far off mountain, it appeared to grow out of the ground – a clear indication of a curved surface. He later devised the forerunner of modern-day longitude and latitude, including measuring what we now call latitude from the equator. In Christian medieval Europe, Bede (7th century C.E. ), a scholar and a Catholic monk, produced an influential treatise that included a discussion of the spherical nature of the world. This work, The Reckoning of Time, was copied and distributed to clerics across the Carolingian empire. Later, in the 1300s, Dante Alighieri’s Divine Comedy also describes the Earth as a sphere. The Catholics weren’t the only religious sect that thought the world was round. The Islamic world is known to have consistently maintained the scientific knowledge of the Greeks and Romans, preserving the works of Aristotle and Ptolemy, among others. They were well aware the Earth was round, having calculated with relatively good precision its circumference in the early 9th century. With extraordinary few exceptions, no educated person in the history of Western Civilization from the third century B.C. onward believed that the Earth was flat. The debate since then among the educated, both religious and secular, was not whether the Earth was approximately a sphere, but exactly what the size of the Earth was. Beyond the educated, even the most empty headed sailor knew the Earth was round simply by the fact that ships and the like disappeared over the horizon with the bottom first and then the mast the last to be sighted. A similar effect is observed when spotting land from a ship. Again, what was the real mystery at this time was the actual circumference of the Earth. Most- correctly -thought Eratosthenes’ estimate was probably reasonably accurate, meaning that if one did not encounter a well stocked land mass in between Spain and Asian to resupply, Columbus’ expedition would end in failure with the crew dying of thirst or starvation. In fact, this would have happened if not for Columbus encountering the Caribbean islands around where he expected to encounter his destination. Columbus, of course, felt that the Earth was much smaller than Eratosthenes’ estimate, so the journey was doable at Columbus’ estimation of only about 3100 miles (5000 km) to Japan, rather than the true 12,400 miles (20,000 km) it is. Queen Isabella eventually sided with Columbus and agreed to finance the expedition, despite the objections of scholars who were consulted over the plan. As to how the myth that people during Medieval times thought the Earth was flat came about, this is up for debate. The idea seems to have first popped up in the 17th century and appears to have been, at least in part, put forth by secular scientists railing against the ignorance and misguided notions of religious groups (specifically Catholics), who they claimed in Medieval times believed the world was flat- ironically, despite the lack of much evidence supporting that claim, and the numerous documented instances of religious scholars from that era stating the Earth is round. The myth gained significant traction in the 19th century with various works, such as Andrew Dickson White’s History of the Warfare of Science with Theology. The “Columbus / Flat Earth Myth” itself was widely popularized in Washington Irving’s The Life and Voyages of Christopher Columbus, which was in numerous places largely fiction, though presented as fact and a scholarly work. In his account, Irving claimed that it was Columbus’ voyage that proved to the world that the Earth was round, going so far as to explicitly state that one of the objections to Columbus’ voyage was that a round Earth wasn’t scriptural, so the voyage was doomed to fail when Columbus encountered the edge of the world. In fact, there is no first hand record of any such objection to Columbus’ expedition, with the primary documented objections having to do with the length of the journey. Irving’s fanciful tale is simply in line with the “Warfare of Science with Theology” viewpoint, which at least in terms of the “flat Earth vs. spherical Earth” issue, historically wasn’t ever a sticking point as has been so often claimed from the 17th century on (though around the 1920s, most scholars stopped believing this myth). One of the only significant Christian works that seems to put forth the notion of a flat Earth was written by an Egyptian Monk in the 6th century AD, Christian Topography. On the whole, though, evidence seems to indicate this work wasn’t very influential, as you might expect given that most educated Christians were well aware of the mountain of evidence that the world was a sphere. That being said, Christian Topography was often cited as support for the notion that Christians thought the world was flat until recently, with those authors casually ignoring all evidence to the contrary. Another common myth surrounding Columbus’ voyage was that he was the first to discover the “New World”. In fact, there is no question that North America was visited by Northern Europeans in the 10th or 11th centuries. Specifically, Norse settlements, one of which has since been excavated, were established in continental North America in the 10th century. The settlements were a failure in part, it appears, due to problems with the Native Americans, who the Norse called Skrælings. However, according to recent scholarship, the Norsemen continued to meet and trade with indigenous Americans, at least sporadically, even after the failure of the two colonies they setup. Not the dull oafs of legend and Capital One commercials, the Vikings apparently made a map of their North American conquests. The Vineland map is believed by some to have been made circa 1440, and demonstrates that at least some Europeans were aware of the existence of continental North America, well before Columbus set sail. Today, there is also increasing evidence, and speculation, that the Americas were visited by Muslim and Chinese explorers long before the “Age of Discovery” in the late 15th and 16th centuries. Although still somewhat up for debate, there is evidence that a Muslim sailor, Khashkhash Ibn Saeed Ibn Aswad, traversed the Atlantic and landed in the New World in 889 C.E. In 956, famed Islamic historian, Abul Hasan Ali Ibn Al Masudi, created a map from his research of this journey that depicts an unknown landmass where America is located. Other voyages to the New World chronicled in Muslim histories includes that of Ibn Farrukh, who seems to have visited islands far to the west of the Canaries in 999 C.E. In his controversial book, 1421: The Year China Discovered the World, Gavin Menzies theorized that the great Chinese admiral, Zheng He, commanded an immense fleet that spread across all of the world’s oceans on voyages of discovery between 1421 and 1423. It is well accepted that Zheng He was a great admiral of the Ming Dynasty and, between 1405 and 1433, orchestrated at least seven massive naval expeditions to explore the Indian Ocean, as well as the seas of Southeast and South Asia. Intending to extend the power of the Ming Empire across the known world, the fleet established trade throughout Southeast Asia, India, Arabia and the Somali Peninsula. Zheng He’s fleet was impressive with over 300 ships including its largest ships over 400 feet long with nine masts (compare this to Columbus’ Pinta which had three masts). Menzies’ even theorized, extremely controversially, that Admiral He continued his explorations around the Cape of Good Hope and along to America in one direction, and also took a northern route around the Aleutians and down along the west coast of California in the other. He supports his theory with old maps, as well as, supposedly, DNA evidence; he also claims there are Chinese shipwrecks off of both American coasts. It probably goes without saying that his theories are not currently well accepted. So – what you are saying, is that the Earth is spherical in shape. Believe what you will – I am still not going to take any chances. Not going to go walking toward the horizon after it gets dark. To be completely factual and accurate, Isaiah 40:22 was written about 732 bce, which first stated the earth was ‘a circle’… long before Pythagoras or any other scientist could take credit for the so called ‘discovery’. That bible verse has proven to be the earliest source of scientifically accurate information on the subject. There is a difference between Circles and Spheres. Sorry, there is no proof that Magellan ever said such a thing. If you have a source, I’d be happy to read it, though. A Circle is not a sphere. And a circle becomes a straight line in the first dimension. It is perfectly correct to describe the earth as a circle, since that is what a sphere looks like from the perspective of outer space. Using the word circle, does not negate the incorporation of the potential for a sphere. (*) The word “sutihat” is from the root word “sataha”. Note: The commentators are well informed about the scientific conclusion that the earth is a globe, but the scientists are considered to be laymen in regard to understanding the meaning of the Qur’an. Because revelation has primacy over science, the Qur’an is the decisive basis for the commentators to insist that the earth is flat. On a human scale (excluding long distance travel, high alt, high speed) the earth is effectively flat. That is how we design and build our houses, offices, malls, schools… even highways which curve with the earth over distance, segment by segment are for all intensive purposes flat. Interestingly, no one had hovered over the earth in a space craft to look down from above to see the shape of the earth. Before 732 BC it must have been common knowledge passed on by word of mouth. Just because it wasn’t recorded before then doesn’t mean it wasn’t known. Rubbish. Everyone knows the Earth is flat. This is why Donald Trump must be elected president. So he can put a lid on this elitist manipulation about a spherical earth. The “Vineland Map” is presumably a map of Vineland, New Jersey, USA…the “Vinland Map” is widely accepted to be a 1950s-era forgery, done on 15th-century parchment; though it was clever enough to have fooled experts at Yale and the British Museum, who authenticated it in the mid-1960s. Also the Piri Reis is a fake and does not represent South America in details as originally believed. 0 Credibility for thia article.